Crab Apple – Dig Delve – An online magazine about gardens, landscape, growing & making. When we arrived here, the house sat alone on the hill. 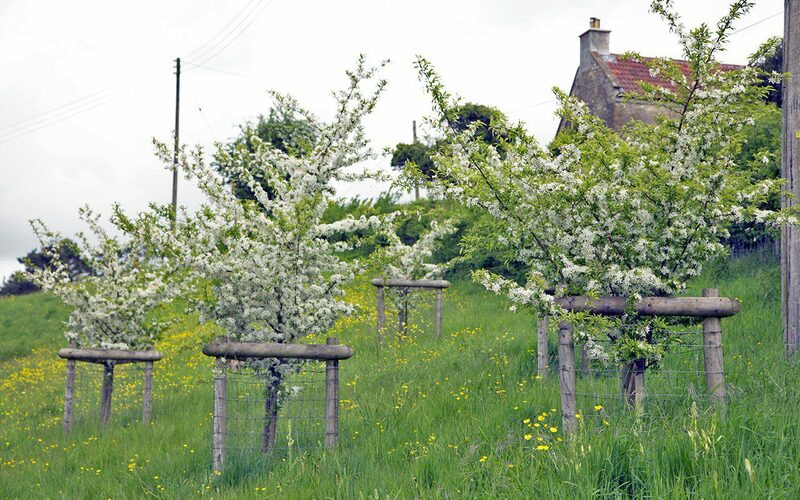 Only the hollies by the milking barn and a pair of old plums in the hedge alongside the house stood sentinel, catching the wind and the rummage of seasonal blackbirds and pigeons. As we moved here in winter it took a while to realise that bird song comes only from a distance and from the refuge of the hedges, which run along the lane and the field margins. Walking down the slope in front of the house that first spring, we soon heard that it is the wood below us that provides the haven for birds. I was brought up in woodland and so am familiar with its qualities. The sound of wood pigeons close to the bedroom windows, the constant activity of bird life in the branches, wind caught in leaves, the movement of dappled light and shade. Living in London was as intimate in its own way; the world around us so close and connected and plants pressed up against the windows. Although I love the country contrast of letting my eye travel here, I struggled initially with the degree of openness surrounding us. Not only was the space acoustically different, the feeling of exposure was unfamiliar and begged understanding. I knew early on – certainly within a couple of months – that we needed trees around us, and herein lay a conundrum. Plant indiscriminately and I was at risk of foreshortening the views that had made us fall in love with the property. But, perched on our hillside, we needed to hunker the house down, to feel as you do when settled into a high-backed sofa, with the feeling of comfort enveloping you whilst still being part of the room. Before the first winter was out, I ordered a dozen crab apples to make a huddle of trees on the slope behind the house. It took much deliberation to decide where they should go. The track leading to the tin barns provided the anchor point between the hedge on its lower side and the open banks above it. The new trees would add an upper storey to the hedge and provide the shelter for a bat corridor. At roughly eight paces between them, they would also offer an easy hop from one to another for the birds. As has become the way here, I staked out their positions with six-foot canes topped with hazard tape so that they are easy to see from a distance. 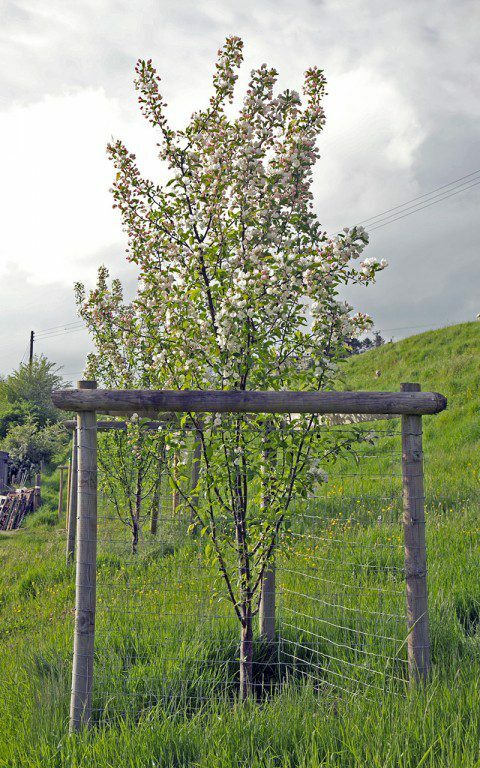 I wanted the trees to arch over the track eventually, like the old holloways hereabouts, to provide a tunnel of blossom in spring and a shady place to emerge from into the light in summer. I didn’t want them in rows or for them to feel organised like an orchard. Over the course of a month the markers were moved about and the sight lines tested until the placement felt right. The crabs were suitable for feeling productive, but I also wanted them to have a connection with the hawthorns in the top hedgerow that we had allowed to grow out to provide shade for the livestock in summer. 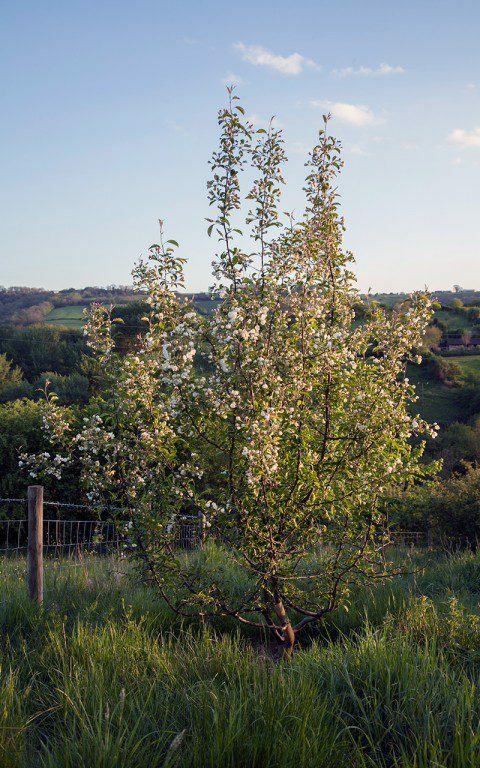 I had been looking at crab apples for quite a few years in a search of a blossom tree that was neither cherry nor amelanchier, which had become my reflex choices when planting blossom for clients. There is a wealth of crabs to choose from and, although I knew Malus ‘Evereste’, ‘John Downie’ and ‘Hornet’ from gardens I had worked at or visited, I wanted mine to be on the wild side, and so I honed my selection to what are probably the best two species. 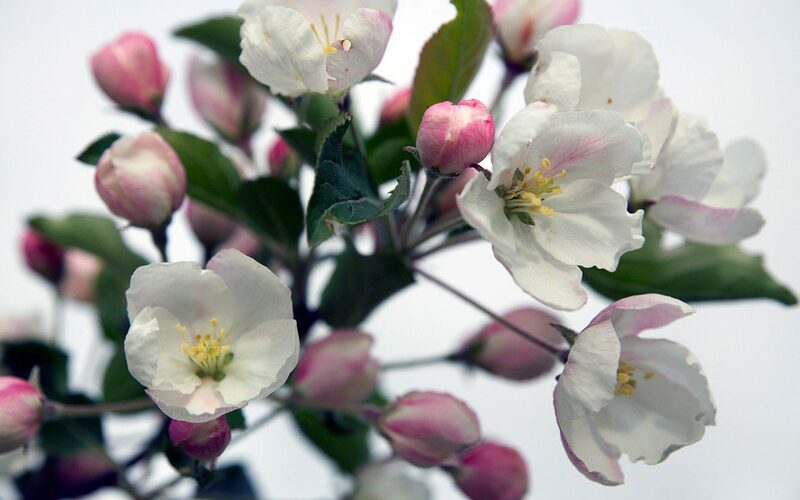 Malus transitoria was chosen specifically for its wilding quality and, of the two species on the bank, it opens a few days earlier than its partner. 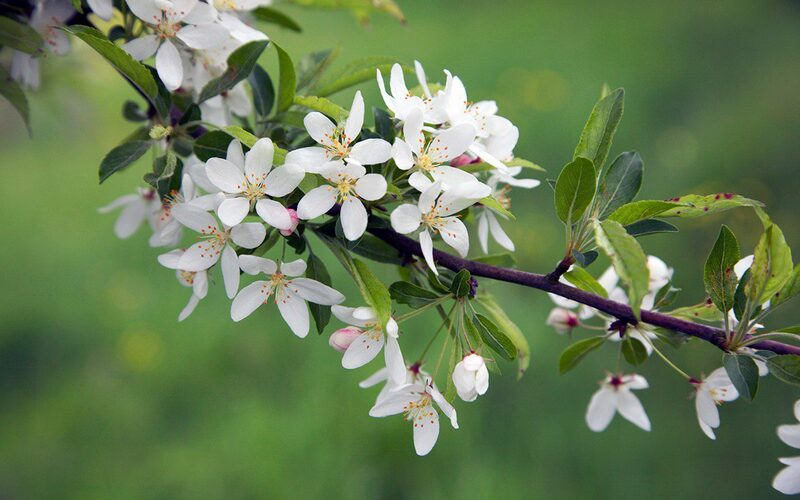 Known as the cut-leaf crab apple its leaves are slim and divided, not entire like the usual apple foliage, and could easily be mistaken for hawthorn. They have a lacy quality and so the tree retains a lightness when in leaf. 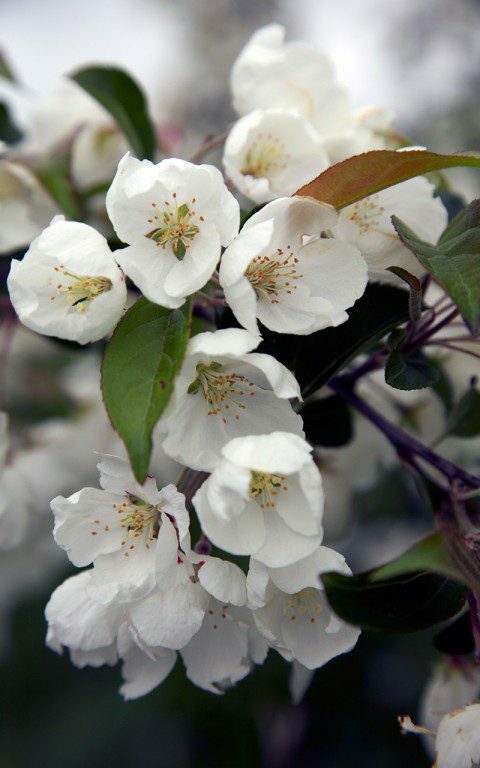 The flowers are pale pink in bud and, though small, completely cover the tree and open in a glorious froth to weight the branches with pure white blossom. The petals are narrow and separate, splayed around a burst of orange-tipped anthers, giving the flowers a star-like quality. After flowering you could easily think the trees were native, but the tiny fruits give them away in autumn when the amber beads pepper the yellowing branches. 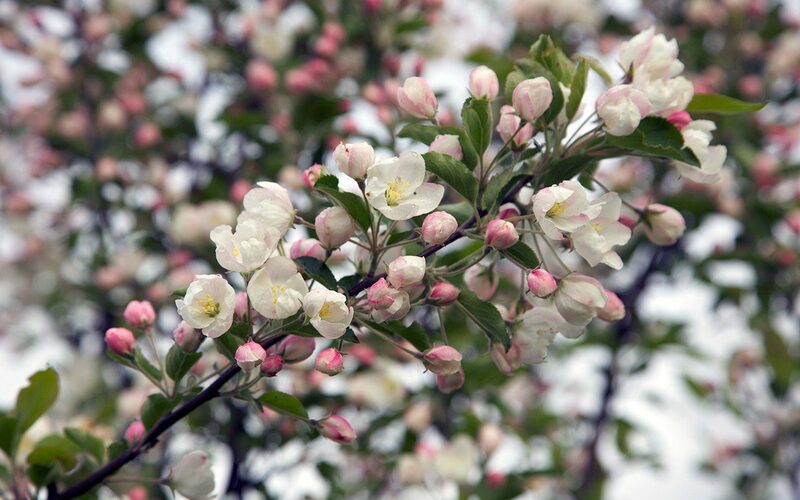 Malus hupehensis, the Chinese tea crab, is the best crab apple according to experienced tree people and another fine discovery of the great plant hunter, Ernest Wilson. Wilson had impeccable taste and the tree, which is quite substantial in maturity, is a spectacle in flower. Once again it is pink in bud, but a stronger shade so that, from a distance, the tree appears pale pink. The flowers are altogether more flamboyant, large and bowl-shaped, hanging gracefully on long pedicels and blowing open to a pure, glistening white flushed with pink. When a tree is in bud and flower, it is a breathtaking moment. The flowers have a deliciously fresh perfume, as welcome as newly mown grass in this window between spring and summer. 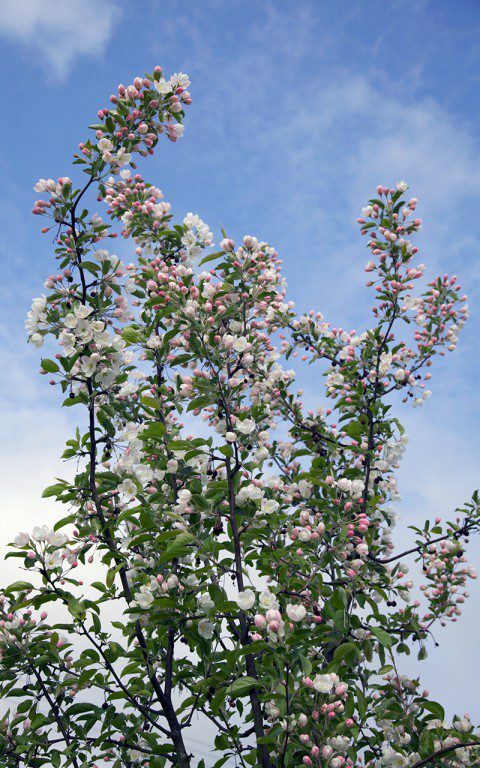 Malus hupehensis (and main image)I like to plant my trees as young feathered maidens. This is one stage further on from a whip, so the trees have their first side branches and stand about a metre twenty high. They are easy to handle at this size and with care they establish quickly to outstrip a more mature tree planted for immediate affect. That first winter I planted the crabs I didn’t know that there are two forms of Malus hupehensis. It was one of Christopher Lloyd’s favourite trees and, naturally, he selected a superior form. Those that shade the car park at Great Dixter are smaller berried, with deep red fruit half the size of the marble-sized fruits on my form. At this size, they are more easily eaten by birds and, had I known, I would have preferred them for the track behind the house for the rush of bird life come the autumn. Look closely and you see that the Dixter trees are more elegant in all their parts; the branches are finer and the tree more open, the leaves are elongated and flushed with bronze when young, and the flowers are slightly fuller, a purer white in bud and open, and with longer pedicels that allow them to tremble exquisitely in the wind. Of course, I bought a couple from the nursery as soon as I saw them. One as an entrance tree by our front gate and the other on the edge of the blossom wood, where it is visible from the house. I already have seedlings from these trees in the cold frame, as they come easily and true from seed. Totally smitten, as time goes on I plan to extend their influence.